Yesterday, the Moto X 2017 ( It’ll be better if we call it Moto X4) leaked via the video that showed the official presentation video being shown on the screen. That leak revealed that the phone has a new design with metal and 3D glass as well as some other interesting features like IP68 rating and AI Integration. If you were still thinking about the other Moto smartphones launching this year, then today, we have got a new leak that reveals information about every single Moto smartphone that is launching in upcoming months. Starting off with the high-end series, the company will launch Moto Z2 Play and Moto Z2 Force and we all already familiar with the phone via previous leaks. And yes, the Moto Mods are continuing with these phones. Along with this, the Moto X4 will be launched too with the 5.2-inch Full-HD display, 3D Glass, and Smart Cam. Now, the company is also going to introduce two new phones in the G series called the Moto GS and GS+ with 5.2 and 5.5-inch FHD displays respectively as well as Full Metal body. The GS+ will have a dual camera setup on the back. Next, we have the two new devices in the ‘E’ series named the Moto E4 and Moto E4 Plus, and we already know how they are going to look via the previous renders and leaks. The Moto E4 will feature a 5-inch display compared to the 5.5-inch on Moto E4 Plus. But, both the phones will feature an HD Display only. The leak also confirms that the Moto E4 Plus has a 5,000 mAh battery. 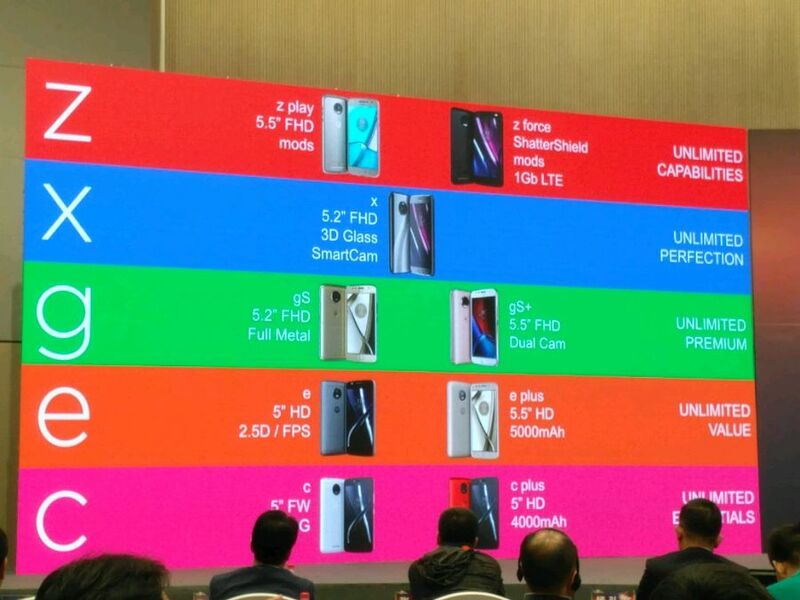 Lastly, Motorola is going to launch a new series of smartphones aimed at the budget friendly price segment. We are talking about the ‘C’ series. The Moto C and Moto C Plus with 5-inch FW and 5-5inch HD display are going to be launched where the C Plus has a huge 4,000mAh battery. Well, now we know about every single Moto Smartphone that is launching this year so, there is almost nothing left to know now as we are now familiar with the specs as well as the design. Are you excited to see these new phones from Motorola? Do let us know via the comments section.